Each Magnum Canvas Wall Tent is handcrafted using the highest quality materials to ensure you'll stay warm and dry for many years to come. The 12.5 ounce canvas provides extra protection from the elements and added insulation to keep the heat in when temperatures drop outside. This canvas is the strongest available and allows minimal shrinkage. Unlike the average camping tent, the 5' tall sidewalls allow you to use the entire interior floor space. Combined with the optional and a wood burning stove, these tents can serve as a semi-permanent structure that stays warm and dry all year round. The internal aluminum frame (purchased separately) is the best and strongest in the industry. Made from 1 1/4" aluminum tubing, these lightweight frames are a perfect way to set up your tent quickly and easily. Or you can choose to build your own frame using our Steel Angle Kit (also sold separately) and EMT conduit that is available at most local hardware stores. 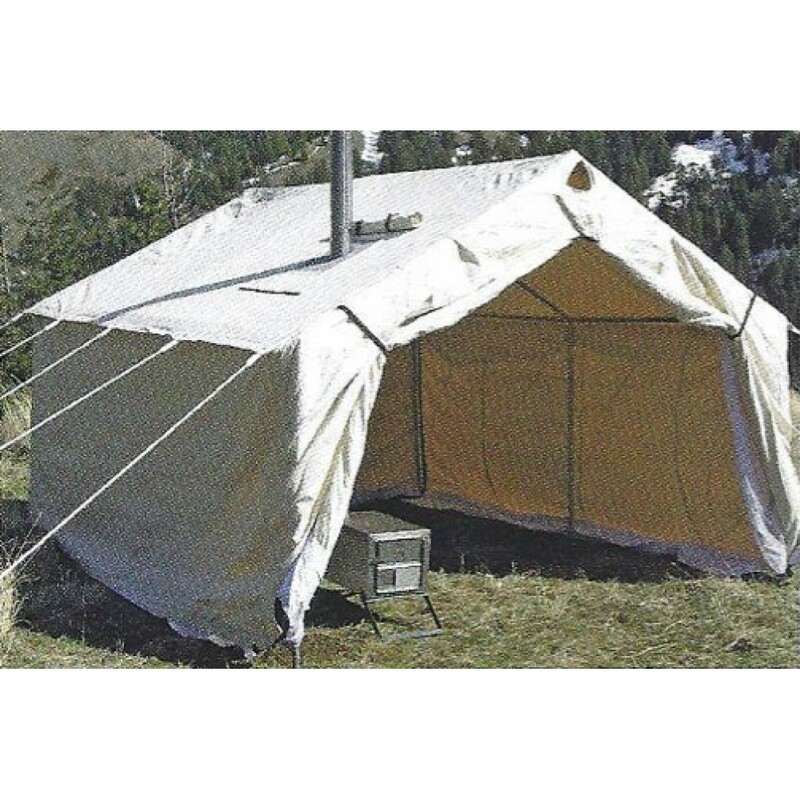 If you're looking for a fast, easy and rugged shelter solution, look no further than the Magnum Canvas Wall Tent. The Food Storage Guys want you to have true value for your hard earned cash. So once again, we've scoured the market to find the right product at the right price. Made right here in America, these premium quality wall tents meet and exceed our rigorous standards. Each Magnum Canvas Wall Tent is handcrafted by American craftsmen, using only the highest quality materials to ensure you'll stay warm and dry for many years to come. Available in four sizes and loaded with features not found in other wall tents the Magnum Canvas Wall Tent has earned the Food Storage Guys' stamp of approval. 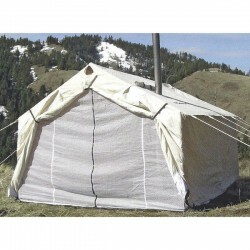 Especially when comparing the low cost of these sturdy 4 season tents. This tent is made from 12oz double-fill army duck canvas that is treated for water and mildew resistance. In addition, the canvas is treated with fire retardant so you can rest assured you'll sleep safe with your wood stove going. This is the toughest canvas available and shrinkage is less than 2%. Using a rain fly will ensure that your tent remains 100% water proof, while still allowing it to breathe. 12.5 ounce Double-Fill Army Duck Canvas. Treated with fire retardant. Water and mildew resistant. Zippered front door with buckled storm door. Large 2 ft x 2 ft screened window in back wall. 10" Rot-resistant sod cloth around wall bottoms. Corners reinforced with extra canvas. Wall bottoms, eves and end walls reinforced with 2" nylon webbing. Seams double-stitched for extra strength. Comes complete with eve ropes, tensioners, steel stakes and tent bag. Heavy Duty #10 zippers are used on doors and windows to ensure long life and hassle-free operation. Large 2 ft x 2 ft screened window can be opened to allow ventilation or closed with a heavy canvas flap to keep the elements out. *FREE SHIPPING applies to the Continental United States only. Please call when ordering for Hawaii, Alaska and International destinations. (1) 12' x 14' Magnum Canvas Wall Tent - does NOT include frame.